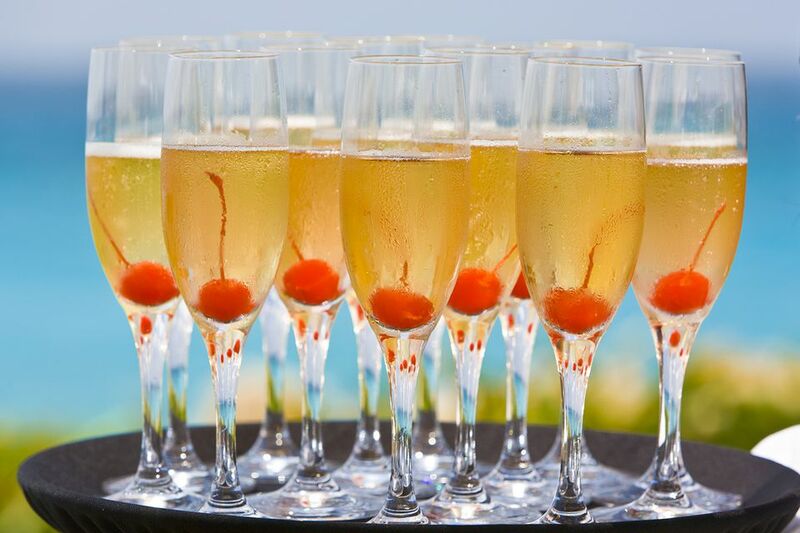 Sparkling wine cocktails are a fabulous addition to any party, even if it is not a 'fancy' affair. You have many great recipes to choose from and there's sure to be a Champagne cocktail for every taste. You could opt for the simple elegance of the original Champagne Cocktail, yet sometimes you might like a drink that's a little more involved. From fruity favorites like the Bellini and Mimosa to new creations featuring Italy's sparkling Prosecco, let's explore some fascinating sparkling drink recipes. Consider the Bellini to be essential in your wine cocktail adventures. The beautiful thing about the Bellini is that you can take in so many directions. Choose Champagne, Prosecco, or your favorite sparkling wine, then decide whether you want to go with peach juice or nectar, or make a fresh puree. Have a non-drinking guest at the brunch table? Switch to the Baby Bellini. You can even make it with raspberries if you like. Anyway, you make it, the Bellini does not disappoint. Invite this lovely cocktail to your next dinner party and enjoy the fresh, bright taste. The Aperol Spritz is a favorite cocktail recipe that doubles up on the bubbles and it's always a delight to drink. Aperol is the key ingredient here and this orange-flavored bitter aperitif is a wonder with any meal. Yet, in keeping with it and Prosecco's Italian roots, you might consider it best served with a pasta dinner. Another attractive and popular recipe, the Elderflower Cocktail is a delight for any occasion. You will love its soft floral flavor set against a bubbly background. Again, you have a number of options with this recipe. St. Germain is a common elderflower liqueur, but if you make your own cordial from the spring flowers, by all means, use that. Also, if you want to skip the Champagne, a white wine will do just fine here. A fun take on the popular Mimosa, this recipe takes you to the tropics with a fantastic vodka. The Pineapple Mimosa is a slight twist on a cocktail every loves and it's so easy to make. The pineapple vodka adds an extra layer of flavor. The lemon is thrown in to balance it with the orange juice that is a Mimosa requirement. Even the honey syrup is a quick homemade ingredient, so you really can't go wrong with this recipe. The Frisco 49 is going to appeal to your DIY side because it's filled with homemade ingredients. 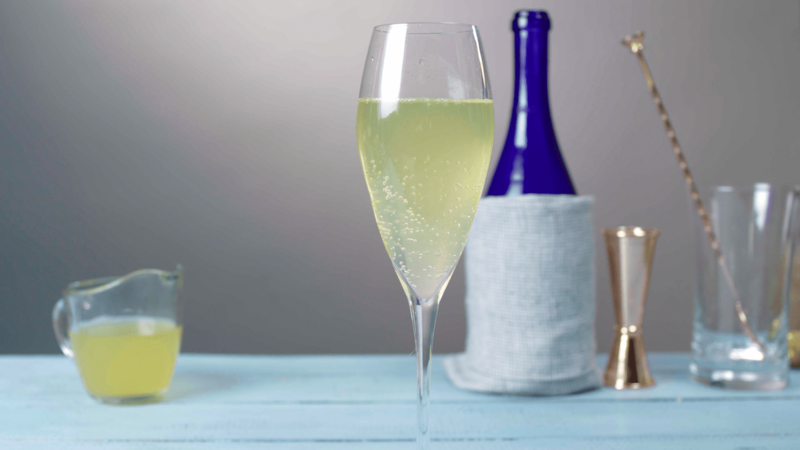 It adds a unique spin to the classic French 75 and it's as fun to make as it is to drink. The key here is to give yourself a few days to perfect the gin infusion, which is done with two varieties of pears. You'll also want to pick up a couple peaches at the market to create the syrup. It's fascinating how the roasted fruit and cinnamon work with honey in this drink. If you want a drink that really shows off your culinary drink-making skills, this is the recipe for you. Fans of classic cinema will recognize the name Lita Grey as the very young wife of Charlie Chaplin. This cocktail celebrates their romance by adding a twist to the drink named after her famous husband. This modern creation has a classic style and retains the sloe gin from Chaplin's drink. To this we add the gin and apricot liqueur of your choice, then it's all topped with sparkling wine. It has a wonderful flavor that definitely is not ordinary. Many of the best sparkling wine cocktails being created today rely on a famous cocktail as inspiration. In this case, we're ramping up the simple and classic Negroni to create magic in a glass. The port replaces the Negroni's vermouth and we keep the gin and Campari for the Ruby Negroni. Beyond adding the Italian sparkling wine (which is often cheaper than Champagne - hint, hint), a little raspberry syrup is tossed in for sweetness. This is also a fantastic aperitif cocktail, so be sure to add it to your dinner party menu. The Champagne Bowler is a true classic straight out of the 1930s and it has not lost any of its charms. It is also possibly the 'wine-iest' cocktail you can mix up because it not only includes two wines but brandy (aka 'burnt wine') as well. You'll find that this recipe is incredibly easy to mix up. Beyond choosing decent wines and cognac, be sure to use only the freshest strawberries. This is the ingredient that makes or breaks the drink. Honestly, this drink is best when served in summer, right in the middle of berry season. Skip it if you cannot get fresh berries. Are you ready for a taste adventure? You will not be disappointed by the Celebration of Citrus which features Spain's sparkling wine known as cava. The drink begins like the famous Americano with Campari and sweet vermouth, which makes it another ideal dinner drink. The citrus fruits step up the flavor, but it gets really interesting once you taste the spicy pepper. There is so much going on here that the cocktail is not for everyone. Yet, it's truly fascinating and worth a try. Yes, by 'stout' we mean the beer, as in Guinness or the like. If you don't think the stout-Champagne combination will work, you'll be amazed. This is a very old drink and extremely easy to make. It's said that the Black Velvet was created to mourn Queen Victoria's husband in the mid-1800s and it is just as impressive over a century later. Is Champagne A Type of Wine? Is Champagne Sweet or Dry to Taste?